Buddha and his disciples. The world’s tallest walking statue of the Buddha in Kandy, Sri Lanka. Subhūti (Sk. & Pl.) understood the potency of emptiness. He appears in several Sutras of Mahāyāna Buddhism which teach Śūnyatā (Emptiness or Voidness). Upāli (Sk. & Pl.) was a top master of Vinaya. He was born in the Shudra class and worked as a barber. Buddha had denied the class system, he ranked his disciples according to the order in which they joined. So Upali was ranked ahead of the ex-princes. 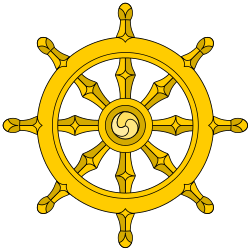 In the First Buddhist council, the Vinaya was compiled based on his memory. Rāhula (Sk. & Pl.) was the only son of the Buddha (when he was still Prince Siddartha) and his wife Princess Pṛthī. He was a scrupulous, strict and shrewd person. When the Buddha went to his hometown, he became the first Sāmanera (novice monk).